Be the first to share your favorite memory, photo or story of Glena. This memorial page is dedicated for family, friends and future generations to celebrate the life of their loved one. 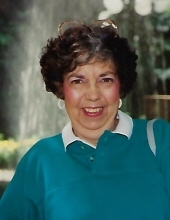 PORMAN, Glena E. - Age 86 of Swartz Creek passed away November 20, 2018. Services will be held 11 AM Saturday, December 8, 2018 at Sharp Funeral Homes Miller Road Chapel, our temporary location at Hill Creek Church 5363 Hill Road, Swartz Creek (Mundy Township). Visitation will be 10AM until time of the service on Saturday December 8 at Hill Creek Church. In lieu of flowers please make a contribution to DHHS Foster Care Shiawassee County. Glena was born March 7, 1932 in Hilham, TN the daughter of James A. and Nora D. (Roberts) McClain. She graduated for Carthage H.S. in TN. Glena worked in Data Entry for Consumers Power and Coilplus, Inc. in AL. She was a member of Corunna Road Baptist Church and the Swartz Creek Senior Center. Surviving are: daughters, Tamela (Porman) Cryderman, and Sheryl (Gregory) (Porman) Tessmer; grandchildren, Chad Stefan, Tanya (Christopher) (Cryderman) Garnett; great grandchildren, McKayla Cryderman, Mason Cryderman, Jordan Stefan, Madisyn Garnett; sister, Jessie Rook; many nieces and nephews; dear friends, Norma Wolfington and Donna Spencer. Glena was preceded in death by; parents; siblings, Grace Adams, Ridley McClain, Charles, McClain, Nellie Hnat, Irene Simon, and Virginia McClain. Tributes may be shared at www.sharpfuneralhomes.com. To send flowers or a remembrance gift to the family of Glena E. Porman, please visit our Tribute Store. "Email Address" would like to share the life celebration of Glena E. Porman. Click on the "link" to go to share a favorite memory or leave a condolence message for the family.